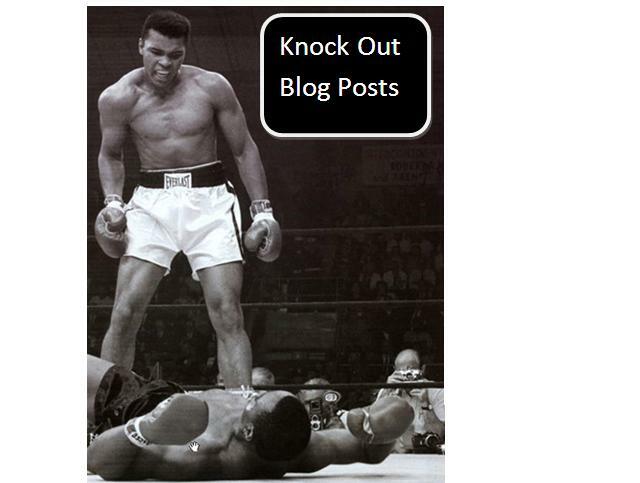 5 Strategies for a Knock Out Blog Post! Want to make yourself indispensable to your clients and prospects? Want to be the go-to person for all things real estate? Well, start blogging! Blogging is an effective way of keeping your name at the forefront of people’s minds when it comes to real estate industry news and relevant information. Others are doing it, why not you? 1. Write with Intention: People generally look to a blog post as a source of information. You therefore want to ensure that your posts impart crucial news and enlightening info that people are sourcing out. Keep it fresh, current and relevant. But, be engaging (and entertaining where warranted) as well. You don’t want your audience reading your posts as a sleep aid! And, whatever you do, don’t use your blog as a press release or an advertising forum – people are not going to keep coming back to read blatant self-promotion. The takeaway: Make sure each post offers readers the illumination they’re looking for, but try to set forth a unique tone, a sense of personality (yours, of course!) as well. 2. Maintain a Sense of Cohesiveness: Remember your grade 7 English Composition class? Remember the rule about every piece of work having an introduction, a body and a conclusion? Well, that applies here. People aren’t going to stick around if they’re trying to make sense of a jumbled, pointless mess. You want your introduction to hook your readers’ attention. The first line or two should create intrigue and make people want to read on. A little drama never hurt anyone. Transition smoothly into the body of your post – and this should be where you become a resource – a wealth of pertinent, need-to-know and up-to-the-minute information. Keep paragraphs relatively short and engaging and keep it focused. Go ahead and be creative – make use of your toolbar and incorporate style elements like numbered lists, bullet points, etc. Your conclusion should briefly summarize the body content, but must also invoke a call-to-action. Hopefully, this will be to contact you to either acquire more information or to hire you as a selling agent! But, remember, no sales pitches! The takeaway: In order for your posts to be informative, they need to primarily make sense and to follow (at least some of) the rules of the written English word. 3. Maintain a Sense of Decorum: You want to be engaging and entertaining in order to maintain your readers’ attention, but you also want to invoke in them a sense of trust in you. It’s essential to therefore maintain a sense of professionalism. This is not to say that you must steer away entirely from being a bit cutting edge, or even informal, but just remember that it is, after all, a business blog and you are a real estate professional. As your mom would say: Watch your language! The takeaway: You can go ahead and make em’ laugh, but just bear in mind your target audience and the purpose of your blog, and write accordingly. 4. Make Use of Visuals: Yes, your post will be engaging and enlightening, but it never hurts to add a little visual enhancement. Insert a relevant photo or two where pertinent and this just adds to the ‘keeping – their- attention’ factor. The takeaway: Photos add an element of interest and help to break up the text. People love pictures! 5. Brevity is Key: Even though people are sourcing you out and wanting to read what you have to say, they won’t want to be reading the second coming of War and Peace. You will only be able to maintain people’s attention for so long, therefore you want to get all of your most important points down in a well-paced manner. If people don’t care to stick around to finish a blog post, chances are, they won’t be returning to check out your next one. A good rule of thumb is to try not to let any post exceed 1000 words. If you’re blogging on a popular topic that is worthy of more than 1000 words, consider breaking the post up into Parts I & II – a great way to keep people coming back for more! The takeaway: Keep it brief and you won’t run the risk of boring your audience! Ready to start blogging? By following the above strategic moves, you should be doing it like a pro in no time at all!! This entry was posted in Blogs, Real Estate, Social Networking, Traffic and tagged Blog Posts, Blogging for Real Estate Professionals, Knock Out Blog Posts, real estate, Real Estate Professionals, Social Media for Real Estate Professionals, Social Networking for Real Estate Professionals, Strategies for Knock Out Blog Posts. Bookmark the permalink.